Turkey cooperates with Russia and Iran to settle the Syrian conflict which is beneficial for solving the issue of consolidating the ceasefire in the war-torn country, Turkish Foreign Minister Mevlut Cavusoglu said Sunday. MUNICH (Sputnik) — The Syrian ceasefire that came into force on December 30 is backed by Russia and Turkey, and has been holding up in general, despite continued reports of violations. The UN Security Council passed a resolution in December supporting the effort. "First, we need to consolidate the [Syrian] ceasefire. Together with Russia and sometimes with the support of Iran we've made a lot of achievements," Cavusoglu said, speaking at the Munich Security Conference (MSC). 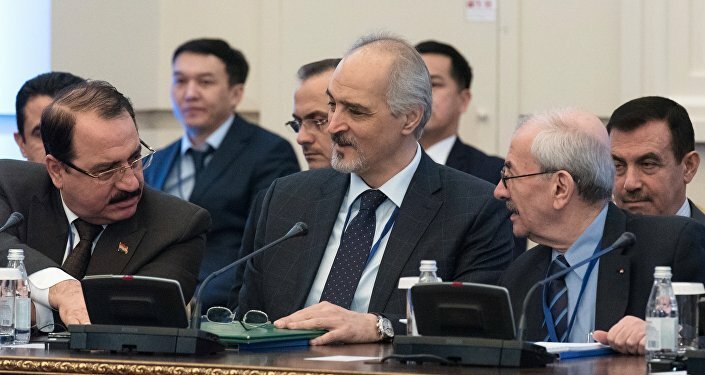 The Syrian settlement talks in Astana were conducive to building confidence between participating parties, but it is necessary to return to Geneva talks, Cavusoglu added. "Astana talks [were] important as a confidence building measure. But now we need to resume the Geneva talks, which is the main business for the political solution and the political transition, which is the best solution for the country." The statement comes as the Turkish military operation in Syria's al-Bab has entered the final stage. Turkey's units entered central al-Bab, the operation is being conducted in coordination with Russia to prevent clashes with Syrian government forces. On Tuesday, the Turkish Prime Minister said that most of al-Bab is under contol. Moreover, Russian and Turkish military jets have repeatedly jointly bombed Daesh targets near al-Bab in Syria.